The Boat School 5-day Yactmaster Preparation course (Sail) is an intensive course to hone your practical skills before you take the the RYA Yachtmaster Coastal or Offshore exam. Depending on your skill level and experience, you can elect to take the Yachtmaster exam at the Coastal or Offshore level. The Boat School 5-day Yactmaster Preparation course (Sail) is an intensive course to hone your practical skills before you take the the RYA Yachtmaster Coastal or Offshore exam. Depending on your skill level and experience, you can elect to take the Yachtmaster exam at the Coastal or Offshore level. The preparation is exactly the same; however, the requirements are different (see the tab “requirements”) and the examiner will be looking for a higher level of ability at the Offshore level. You can choose which level to apply for anytime before the actual exam date and, if you’re uncertain, your instructor can help you decide during the course. Although the Yachtmaster exam is essentially practical, candidates are expected to demonstrate a sound knowledge of navigation (including tidal streams and heights), weather and forecasts, collision avoidance, pilotage and passage planning. For this reason, at The Boat School, we always run a 2-day theory refresher immediately before the 5-day practical course. You can opt out of this refresher, but we highly recommend doing the course even if you think your theory is up to scratch! We will book your RYA Yachtmaster exam for dates immediately following the Prep course. In most cases, the exam will last two full days. In arranging travel, you should therefore plan to spend 7 full days with us, or 9 full days if you elect to do the theory refresher. 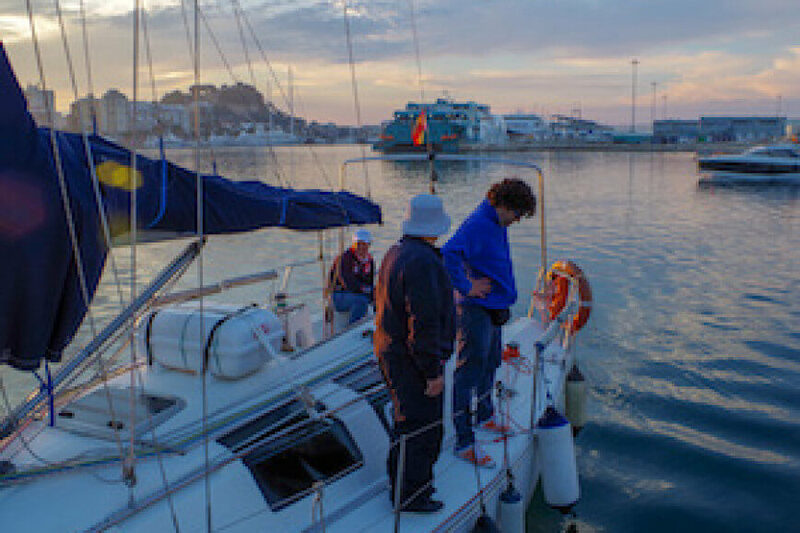 The Boat School course to obtain the RYA Coastal Skipper (Sail) certificate is taught in small groups with a maximum of four Yachtmaster candidates. The Yachtmaster Certificate of Competence is the “gold standard” in sailing qualifications and, for many, the key to a career in yachting; however, you do need to check very carefully that you meet the requirements. With an open group booking, you book a place on a course and we’ll admit up to a maximum of four students onto that same course. This is the most economical option; however, it’s also the least flexible option if your availability is limited. The price of a seat on an open course includes fuel and mooring fees away from our base. We schedule courses in accordance with the availability of students interested in the course. Please contact us for details of the next course. With this option, you charter a sailing yacht and we provide the instructor and teaching materials. This option gives you maximum flexibility in terms of dates and the option to choose the boat on which you’ll be learning (subject to availability). As with any charter, you’re responsible for paying the fuel for the boat as well as mooring fees away from our home port. If you already own a yacht, or if you have a friend who owns a sailboat, we’re more than happy to run this course on your own boat. This option is significantly cheaper than open groups and charters; however, you do need to make sure that your boat is up to the standard required by the RYA for training. RYA examiners fee and travel expenses. The content of the Prep course will depend on the needs of the candidates but you should expect to spend a lot of time cruising at night and carrying out various challenging boat handling exercises. The course will based around the exam syllabus in the RYA Yachtmaster Scheme Syllabus and Logbook (G158) and is intended for fine tuning existing skills rather than teaching new ones. The exam can require you to demonstrate knowledge and competence across a very wide ranging syllabus (see Logbook G158 pages 74-76.) so the Yachtmaster preparation programme will be demanding and hard work. You can expect to be working long days and into the evening. During the Yachtmaster Prep course your instructor will frequently update you on your progress and ability and recommend which exam you should aim for – Coastal or Offshore. Below is a list of the prerequisites you need before you can take the exam together with the documentary evidence you will need to present. This documentary evidence will be reviewed by the examiner at the start of exam. If it is not complete, the exam cannot continue. To be absolutely clear, you will not be permitted to take the exam if any of the following does not meet the required standard. However, you will still be charged for the use of the vessel, and may also be liable to cover the costs of the examiner’s time and travel. All the information below is also available in the RYA Yachtmaster Scheme Syllabus and Logbook, (G158) available from the RYA (www.rya.org.uk). Minimum of 2500 sea miles logged within the last 10 years, of which at least 1,250 MUST HAVE BEEN in tidal waters. 5 passages of over 60 miles . Of these you must have been skipper for a minimum of 2 passages. A minimum of 2 qualifying passages must have been overnight. Please contact us for a more detailed description of the requirements. You can choose to complete this course either as part of an open group or you can rent a boat for the day and complete the course with family and friends. If you choose to book a place on an open group, we’ll put a maximum of four people on your course. Click on the “Book Now” link to get course dates. We run Yachtmaster Preparation courses at least once a month, except in the months of July and August.